Completing your tax return the right way doesn't involve hurriedly filling in paperwork on April 15th with the hopes that the IRS will push your return along without a second look. Doing a complete and accurate tax return involves gathering information throughout the year, keeping track of changes in tax law and being aware of tax planning opportunities that may arise, which could keep more money in your pocket. Unlike many seasonal tax preparers, we encourage personal contact with our accountants and don't charge extra for it. We're here for you in case something comes up regarding your taxes throughout the year, and we're here for you now. If you have any questions about how SRI Tax & Accounting can help you minimize your tax liability and headache,.give us a call at (419) 782-6727 or email us. 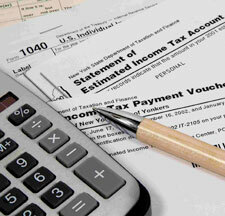 Hire a professional tax accountant and receive capable assistance with your tax accounting and tax return preparation. Our expertise in tax returns and other tax return services can save you money and give you peace of mind that you have had your tax returns completed professionally. Be freed of the taxation monster by giving these tasks to a tax accountant. SRI Tax & Accounting is here to help you make your taxation decisions and make tax planning easier. Personal tax and financial planning encompasses complex issues for financially successful individuals and families. We provide independent personal tax and financial planning advice on your individual taxes, personal financial planning, retirement planning and mortgage services. After the tax filing season, we also offer all clients additional professional income tax planning services to emphasize a proactive approach to managing future savings, deductions, exemptions, tax preferences and income recognition. A professional tax plan puts the taxpayer, not the IRS, in control.